A decrease in the spot price of a currency. Often initiated by a government announcement. The active decision of a government to reduce the value of its own currency vis a vis other currencies. Devaluation occurs exclusively in fixed currencies, when the currency in question is pegged to another currency. Governments devalue their own currencies to make their exports less expensive in foreign markets. If a company exports its products for the same price in the local (devalued) currency, it is cheaper for consumers to buy those products in their own currency. See also: Depreciation. A reduction in the value of one currency in relation to other currencies. For example, when Mexico devalued the peso, more pesos were required to obtain a given amount of a foreign currency. Devaluation is generally undertaken by a government in order to make its country's products more competitive in world markets. Devaluation can significantly reduce the value of investments held by foreign investors in the devaluing country. In the case of the peso devaluation, U.S. investors who held high-interest peso accounts in Mexican banks found their account balances worth very little in terms of U.S. dollars. Devaluation is a deliberate decision by a government or central bank to reduce the value of its own currency in relation to the currencies of other countries. Governments often opt for devaluation when there is a large current account deficit, which may occur when a country is importing far more than it is exporting. When a nation devalues its currency, the goods it imports and the overseas debts it must repay become more expensive. But its exports become less expensive for overseas buyers. These competitive prices often stimulate higher sales and help to reduce the deficit. an administered reduction in the EXCHANGE RATE of a currency against other currencies under a FIXED EXCHANGE RATE SYSTEM; for example, the lowering of the UK pound (£) against the US dollar ($) from one fixed or ‘pegged’ level to a lower level, say from £1 = $3 to £1 = $2. Devaluations are resorted to by governments to assist in the removal of a BALANCE OF PAYMENTS deficit. The effect of a devaluation is to make imports (in the local currency) more expensive, thereby reducing import demand, and exports cheaper (in the local currency), thereby acting as a stimulus to export demand. Whether or not a devaluation ‘works’ in achieving balance of payments equilibrium, however, depends on a number of factors, including the sensitivity of import and export demand to price changes (see ELASTICITY OF DEMAND); the availability of resources to expand export volumes and replace imports; and, critically over the longer term, the control of inflation to ensure that domestic price rises are kept in line with or below other countries' inflation rates. Devaluations can affect the business climate in a number of ways, but in particular provide firms with an opportunity to expand sales and boost profitability. A devaluation increases import prices, which makes imports less competitive against domestic products and encourages domestic buyers to switch to locally-produced substitutes. Likewise, a fall in export prices is likely to cause overseas customers to increase their demand for the country's exported products in preference to locally produced items and to the exports of other overseas producers. If the pound, as in our example above, is devalued by one-third, then this would allow UK exporters to reduce their prices by a similar amount, thus increasing their price competitiveness in the US market Alternatively, they may choose not to reduce their prices by the full amount of the devaluation in order to increase unit profit margins and provide additional funds for advertising and sales promotion, etc. Contrast with REVALUATION, definition 2. Fig. 44 Devaluation. 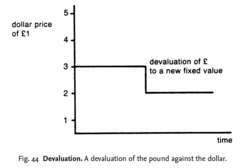 A devaluation of the pound against the dollar. an administered reduction in the EXCHANGE RATE of a currency against other currencies under a FIXED EXCHANGE-RATE SYSTEM; for example, the lowering of the UK pound (£) against the US dollar ($) from one fixed or ‘pegged’ level to a lower level, say from £1 = $3 to £1 = $2, as shown in Fig. 44. Devaluations are resorted to by governments to assist in the removal of a BALANCE OF PAYMENTS DEFICIT. The effect of a devaluation is to make IMPORTS (in the local currency) more expensive, thereby reducing import demand, and EXPORTS (in the local currency) cheaper, thereby acting as a stimulus to export demand. Whether or not a devaluation ‘works’ in achieving balance of payments equilibrium, however, depends on a number of factors, including: the sensitivity of import and export demand to price changes, the availability of resources to expand export volumes and replace imports and, critically over the long term, the control of inflation to ensure that domestic price rises are kept in line with or below other countries’ inflation rates. (See DEPRECIATION 1 for further discussion of these matters.) Devaluations can affect the business climate in a number of ways but in particular provide firms with an opportunity to expand sales and boost profitability. A devaluation increases import prices, making imports less competitive against domestic products, encouraging domestic buyers to switch to locally produced substitutes. Likewise, a fall in export prices is likely to cause overseas customers to increase their demand for the country's exported products in preference to locally produced items and the exports of other overseas producers. If the pound, as in our example above, is devalued by one-third, then this would allow British exporters to reduce their prices by a similar amount, thus increasing their price competitiveness in the American market. Alternatively, they may choose not to reduce their prices by the full amount of the devaluation in order to increase unit profit margins and provide additional funds for advertising and sales promotion, etc. Compare REVALUATION. See INTERNAL-EXTERNAL BALANCE MODEL. It seems that Spencer mistakenly assumes that to devalue the gods is to automatically give way to nihilism and perhaps become less human, so he spends his entire book adamantly arguing that the blues is secretly "theological. I agree with David that playing the semi-finals at Wembley devalues the FA Cup," The Sun quoted Ferguson, as saying.